In Windows Server 2008 (Vista) a new feature appeared that allowed to attach a Windows Scheduler task for any event in system logs. 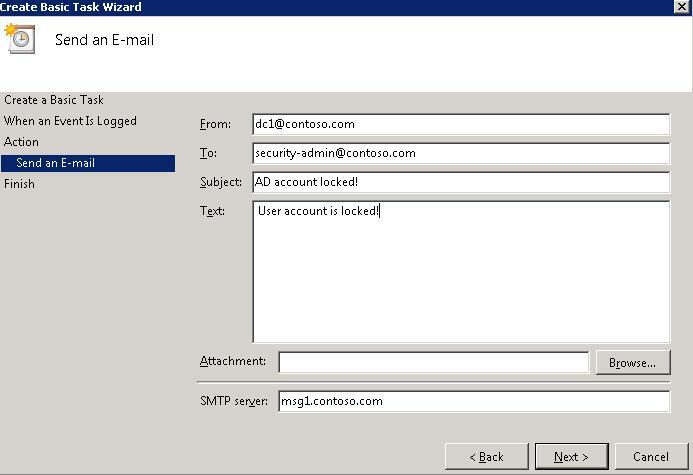 Using this feature, an administrator can assign a specific script or sending e-mail alerts to any Windows event. Let’s consider this feature in detail. 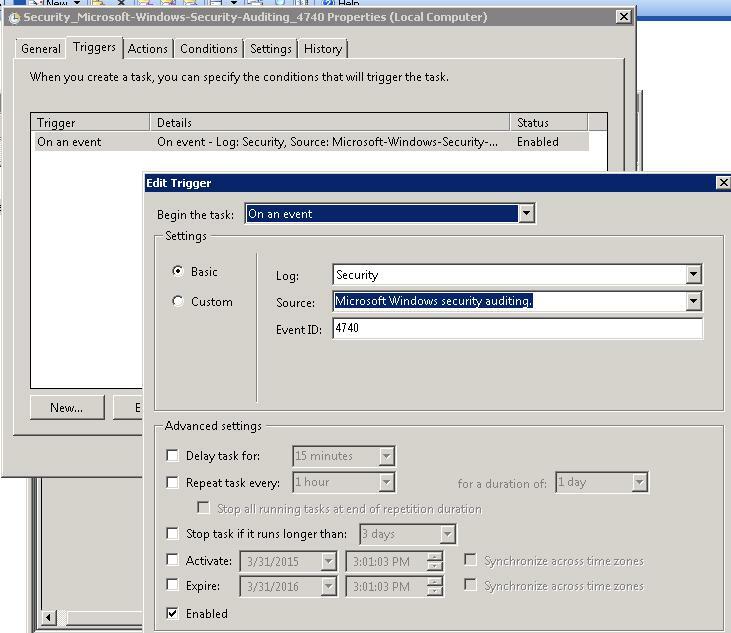 Running tasks when certain Windows events occur is based on the close integration of Task Scheduler and Event Viewer. 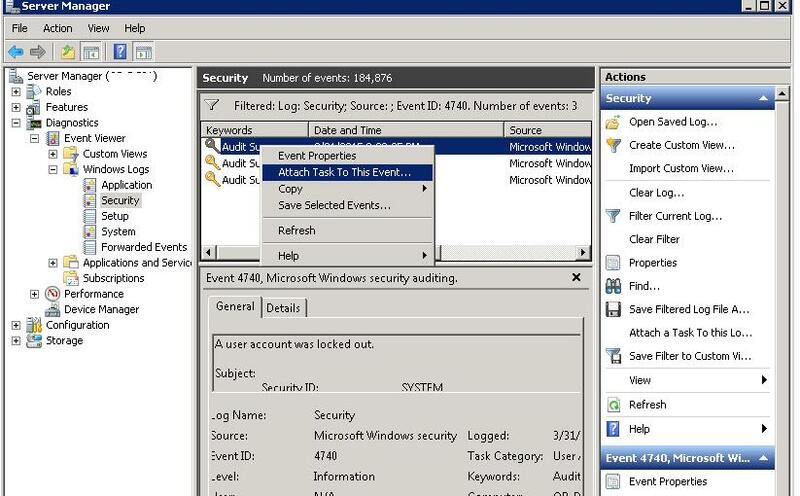 You can assign any Scheduler task to any Windows event directly in Event Viewer console. As a response to an event, Task Scheduler can run a script or send an e-mail notification to an administrator (or any other user). 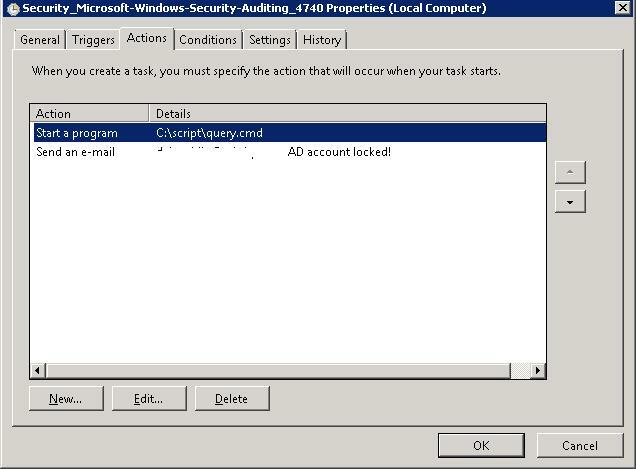 Suppose, our task is to notify a security administrator about the lockout of an Active Directory user account. Tip. We have chosen this event for illustrative purposes. In fact, the scope of applying this feature is quite wide. These can be the notifications of Windows service stops, running an app after Exchange backup is over, notifications of changes in Active Directory security groups, or changes in certain directories or files, etc. 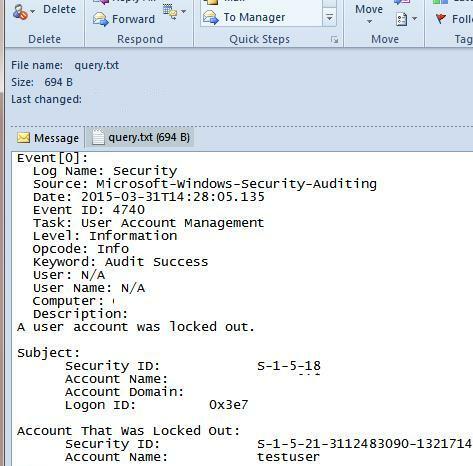 An event of the lockout of an AD user account is registered in the Security log on the domain controller. The Event ID of the lockout is 4740. 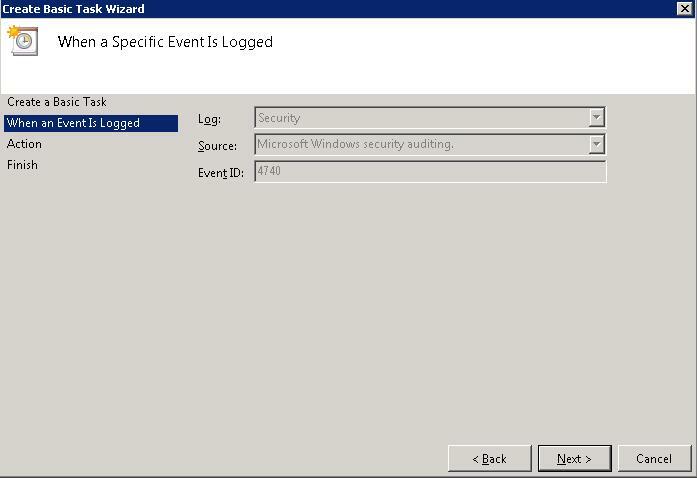 Open Windows Event Viewer (Event Viewer — eventvwr.msc) and look for this event. Right-click it and select Attach Task To This Event. 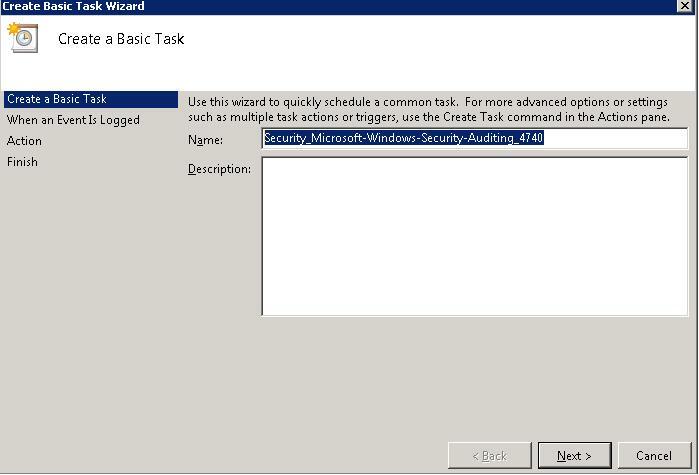 Create Basic Task Wizard is launched. The Wizard prompts to specify the task name. It is generated automatically — Security_Microsoft-Windows-Security-Auditing_4740 and it is fine for us. We select an e-mail notification. Specify a sender, a recipient, an SMTP server address, a subject and a text of the email. In the last step of the wizard, you can view the trigger settings. As a result, a new task connected to event 4740 appears in the Task Scheduler. Open Task Scheduler console in Administrative Tools. The new task can be found in Task Scheduler Library -> Event Viewer Tasks. Here you can also change event trigger settings and force it to test the response to the event. Tip. If you have to attach one trigger to several EventIDs, you need to specify them separated with commas. The trigger becomes active. 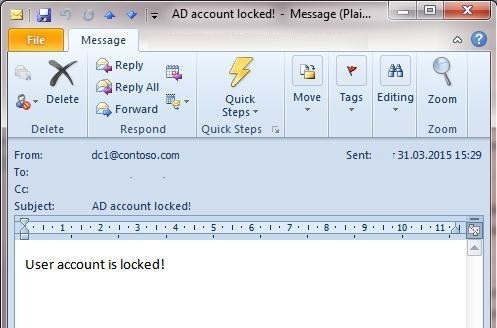 When any AD account is locked out, a notification letter will be sent to the specified e-mail address. Now you only have to open the settings of the trigger created earlier in Task Scheduler. In Actions tab, add a new action — start script query.cmd. Then you need to change the order of the actions, move it to the top of the list using arrow buttons on the right. (the script should be executed first). Then edit the second action — sending an e-mail — by selecting c:\script\query.txt as an attachment to the letter. Note. In our example, to make the task work properly, you have to run it elevated. To do it, check in the settings Run with highest privileges. Let’s test the task again. Now the administrator will receive a notification with the attachment by e-mail, which contains the data on the account name, lockout time and other useful information. Tip. Using Windows event triggers to alert the administrator about the critical issues on the servers is not a full-featured substitute to a monitoring system, like System Center Operations Manager or Zenoss. However, it is a simple built-in monitoring and notification tool for small businesses with no need to invest in implementing or training staff. 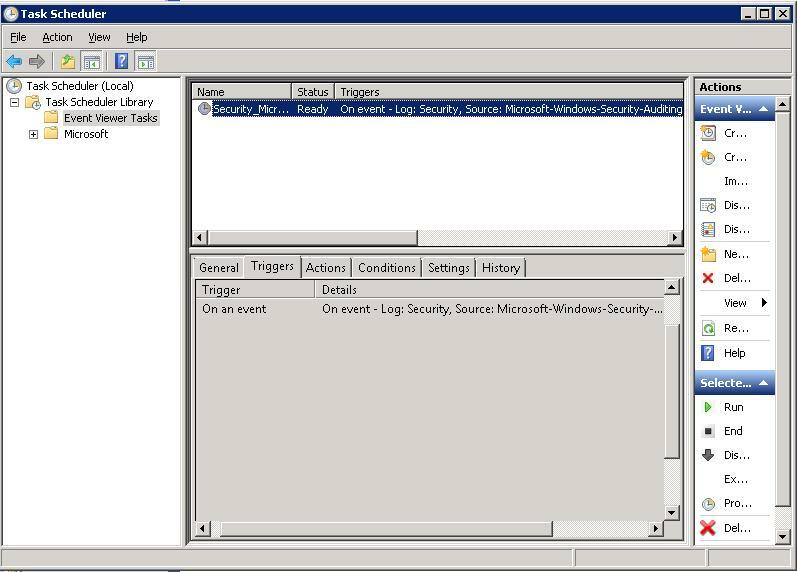 Binding Scheduler tasks to events in system logs works in all Windows versions from Windows Server 2008 / Vista. 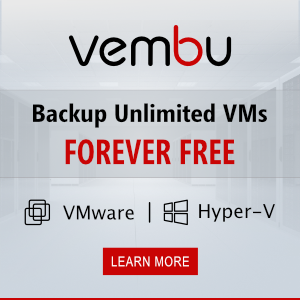 This feature allows to quickly alert the administrator of certain server issues and solve them. Note. In Windows Server 2012 R2 Task Scheduler does not support email sending (deprecated) . For this purpose better use the PowerShell 3.0 – Send-MailMessage.